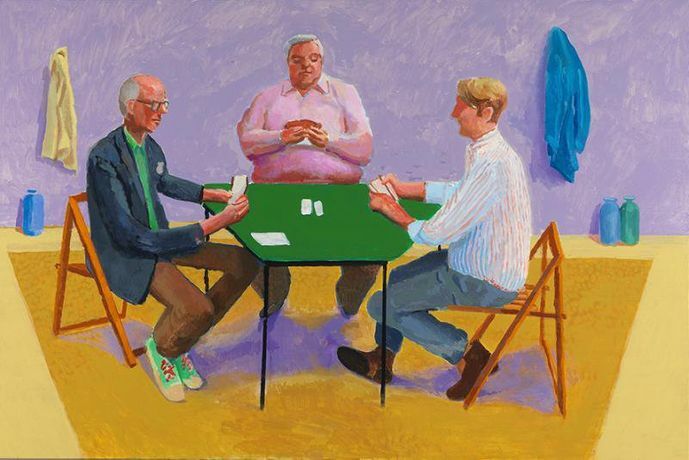 The show is an exploration of David Hockney’s interest in perspective and features a series of group portraits, including those of card players, and other portraits and scenes painted in his Los Angeles studio in 2014 and 2015. “Painters have always known there is something wrong with perspective. The problem is the foreground and the vanishing point. The reason we have perspective with a vanishing point, is that it came from optics. I am sure that that’s what Brunelleschi did. He used a five inch diameter concave mirror to project the Baptistry onto his panel. This gives automatically a perspective picture, just like a camera would. This is why there is always a void between you and the photograph. I am taking this void away, to put you in the picture. photograph them. Everything in the photographs is taken very close. The heads the jackets and shirt and shoes are all photographed up close. Each photograph has a vanishing point, so instead of just one I get many vanishing points. It is this that I think gives them an almost 3D effect without the glasses. I think this opens up photography into something new.